Long-term weather patterns averaged over 30 years or more make up our climate. Human well-being—our infrastructure and agriculture—depend on a reliable climate. This reliability allows farmers to plant seeds in the spring with confidence that temperatures and rainfall will sustain crops in the coming months. It allows communities to build and maintain roads, buildings, and drainage systems best suited to local conditions. Earth’s climate is controlled by the amount of energy that flows through the atmosphere, oceans, and land. By adding heat-trapping gases to the atmosphere—primarily carbon dioxide—people are increasing the amount of energy in the Earth system that would otherwise escape to space. This increase in energy is changing Earth’s climate, and consequently, the weather patterns that people rely on are shifting. Changes in long-term weather patterns have wide-ranging impacts on ecosystems and peoples’ lives. Designed to observe land and coastal ecosystems, Landsat instruments provide an unparalleled space-based record of the impact of climate change on Earth’s landscapes, the growth and loss of carbon- storing forests, and land use related to local climate change. 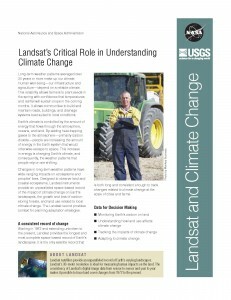 The Landsat record provides context for planning adaptation strategies.